I spent the holiday weekend sitting in the sunshine reading digital economy books of varios types (in between cooking for the family and playing with the 10 week-old). 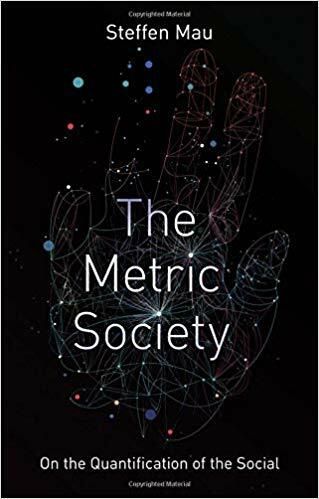 First up was Steffen Mau’s The Metric Society, one of the slowly expanding genre of sociology of economic measurement books. The underlying theme is the use of metrics to quantify the qualitative, and the consequences of the appearance of objectivity: “By assigning a number to the thing observed, we take a step toward objectivizing it.” At the same time, measurement ‘disembeds’ phenomena from local context and knowledge. “Numbers not only isolate information from its original context but also place it in extended comparative contexts.” The added spice in this book is the ever-growing scope of the use of data as digitalisation marches on. 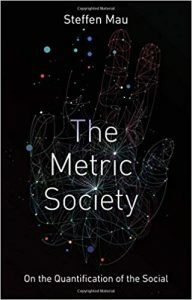 And, like other similar books, The Metric Society is pretty pessimistic – this implies, it suggests, a panopticon society with entrenched structures of inequality. After all, “Categorical systems, once established, become extremely hard to overthrow.” However, I decided the power of numbers gives some reason to be cheerful. As Mau writes: “The nomination power invested in indicators, data and measurements can potentially restructure whole areas of society and impose new logics of action.” As Lenin said (quoted here): “We must carry statistics to the people and make them popular.” My new motto. While people might find an obsession with economic statistics a bit – nerdy – in fact it’s a revolutionary programme! 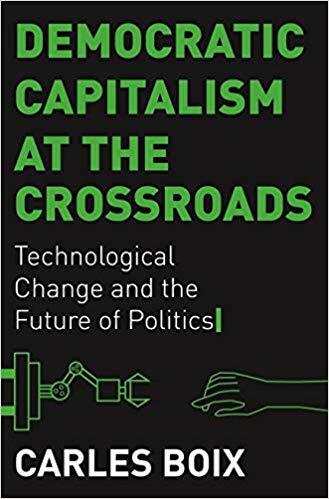 The second book was a proof copy of Democratic Capitalism at the Crossroads by Carles Boix, out next month. I probably shouldn’t give too much of a preview before its publication date, but this is about the interplay between the economics and politics of digital – as the subtitle puts it, ‘technological change and the future of politics.’ The first half of the book compares three modes of capitalism, the 19th century Manchester variety, the 20th century Detroit variety and the 21st century Silicon Valley one. The second part discusses the interaction between digital technology, especially AI, and the labour market. Quite a lot of this covers the economic literature on the issue of the skill bias of technical change, and the resorting of jobs into tasks in extended supply chains, so this is familiar territory. 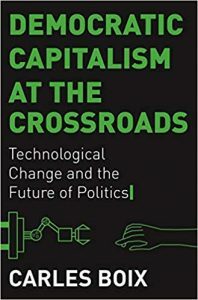 The polarisation of jobs and wages is linked to populist politics and the prognosis is somewhat gloomy – the author is a bit techno-determinist, taking the ‘half of all jobs’ to be taken by robots line as more of a forecast than a thought-experiment. The book ends with some rather generic recommendations – enhance skills, pay a universal basic income. I’m sure it’s right to draw the link between the economic and political polarisations, but I’m more in the territory of taxing multinationals, capping CEO pay, enforcing competition policy etc. 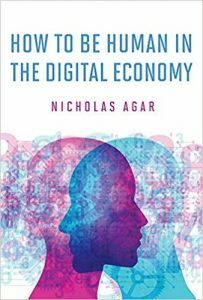 The third was How to Be Human in the Digital Economy by Nicholas Agar. It advocates ensuring there are ‘human’ jobs as more and more activities get automated – in effect, the book takes Baumol’s well-known prediction about the growing share of employment in the least productive sectors, and, labelling this the ‘social economy’, argues against seeking ever greater efficiency in these jobs. Although I agree – and hence it means interrogating what we mean by ‘productivity’ in different types of job – I found the book rather rhetorical. Eg, “AI is the digital superpower that thwarts traditional human responses to technological unemployment.” Whereas Boix has rather too many numbers and charts, Agar has too few. The latter’s suggestion for paying for the “less productive” social economy is the Lanier/Weyl data-as-labour idea, but otherwise it is not very specific about how to create the desired social economy. Anyway, it’s quite interesting to see this crop of books on AI/digital and the future of the capitalist democracies. No doubt there are many more to come. John Quiggin has a mission to correct the perception that economics implies markets are always marvellous and government intervention terrible. The title of his new book, Economics in Two Lessons, riffs on a comment by Paul Samuelson about a 1946 bestseller called ‘Economics in One Lesson‘: “When someone preaches ‘Economics in one lesson,’ I advise: Go back for the second lesson.”Apparently, Economics in One Lesson by Henry Hazlitt, a ‘free market’ advocate has sold over a million copies and been continuously in print – who knew? I’ve never read it. Quiggin’s response in Economics in Two Lessons is an attempt to battle the perpetual appeal of simple answers to complex problems. 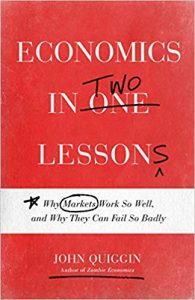 Economics in Two Lessons: why markets work so well and why they can fail so badly is essentially all about the many ways in which markets can fail. The books starts with Lesson One: the concepts of opportunity cost, gains from exchange and equilibrium, then introduces complexities: time, information (lack of) and uncertainty. Some nice applications follow, such as price controls, ‘free’ goods, spectrum auctions, road pricing. Quiggin uses the concept of opportunity cost as a frame for the remainder of the book, including when market prices diverge from opportunity cost. 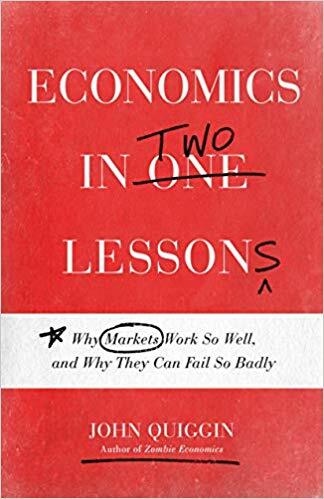 “Most of the questions of principle involved in public policy can be illuminated by the careful application of the idea of oportunity cost and its relationship to market prices.” Lesson One is that market prices reflect and determine opportunity costs in production and consumption. Lesson Two is that there are social opportunity costs to be taken into account as well. Hence the book then moves on to the ‘second lesson’, turning to income distribution, unemployment, natural monopolies, externalities like pollution and financial bubbles. The final section turns to policy prescriptions for a market failure world. For example, a chapter on income distribution looks at unions, minimum wages, and issues relating to income ‘predistribution’ such as intellectual property and limited liability. There are plenty of examples and the book is very clear, making it an attractive supplement for undergraduate courses – I guess this is the target market as each chapter has further reading. I like the way Quiggin weaves in the history of economic thought on these issues. It’s a shame he feels the need to knock ‘mainstream’ economics so much; there’s little here for a mainstreamer to disagree with, except swipes like these: “The term ‘externality’ is one of those bits of jargon that most economists would be at a loss to explain.” What a bizarre claim. I have other quibbles – for instance, I’d disagree that Mill-ian utilitarianism is inherently more egalitarian than post-Pareto welfare economics. 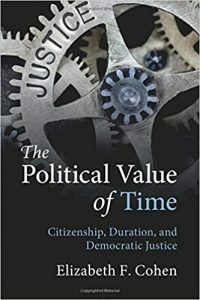 On the whole, though, this is a highly readable introduction to the intellectual framework of modern policy economics, with plenty of lively examples (although I hope that those teaching public policy economics will also consider my forthcoming – late 2019/early 2020 – Markets, States, People……). It doesn’t dethrone my favourite book to recommend to newcomers to economics, John McMillan’s Reinventing the Bazaar either, but is well worth reading. Just remember – this isn’t anti-mainstream economics, it’s what economics is. You would expect a book about the 2008 financial crisis by three of the key policymakers dealing with it to aim to explain and justify the actions they took throughout the crisis. Firefighting: The financial crisis and its lessons by Ben Bernanke, Tim Geithner and Hank Paulson does this. But it doesn’t come across as being particularly self-serving. Obviously they make their case in arguing that the counterfactual world would have been far worse. But they also acknowledge the role of luck, both good and bad, and do a good job of explaining the political and institutional/legal constraints on policy responses, and the complexity, speed and chaos of the situation. This is a US focused account, and is not trying to be a comprehensive account of the crisis. It zooms out to describe the outlines of events and the policy debates and processes. Major steps – such as the Fed becoming lender of last resort for the world through extending repo lines to foreign central banks (rightly empahsized in Adam Tooze’s Crashed as a significant step) get a sentence. There are some insider nuggets. I hadn’t known that Paulson’s brother had a senior role at Lehman just before it went under, for instance. AIG shareholders and executives do not come out of it well. It is surprisingly well-written for a book jointly authored by three senior economic policy guys. I guess the hoped-for audience is Congress. The overwhelming message I took away is that the firefighting policy response was massively hindered by a fragmented regulatory landscape and a zeitgeist of not getting in the way of the markets. It is hard to know when the situation is moving from normal if large correction to crisis, but when that point is identified the government has to act swiftly and decisively. Many of the mis-steps identified at the time and withhindsight were due to legal limitations on the power of the Fed or Treasury to act. Leverage has diminished somewhat (not nearly enough) since the crisis. But as we’re back in a context of a “prevailing mood” of light enforcement, and ‘regulatory arbitrage’ by the finance sector to evade what regulation there is, no greater cohesion among financial regulators in the US than before, and a long expansion with lax credit conditions – oh, and less scope for monetary and fiscal relaxation – this is all pretty alarming. Will it take another financial firestorm for the “prevailing mood” to change. Read Firefighting and worry.